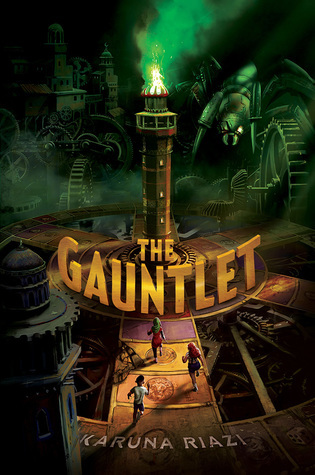 The Gauntlet is a book about many wonderful topics: friendship, family, games ... but it is going to make you hungry. I mean it. Grab some pastries for nibbling as you devour this fantastic book, because you will crave some sort of sticky-sweetly-carby deliciousness. So. Before The Gauntlet launched it was riding high on my to-read list but I had no idea (no idea!) that the author, Karuna Riazi, and the lovely Kaye @gildedspine were the same person! Kaye is a truly lovely person and a fantastic voice in the community, so to have a whole book from her was a rare and delicious treat. It is Farah's twelfth birthday, which means her house is full to bursting with family and friends and food. She's irritated, though, because her little brother Ahmed, is totally monopolizing her time on her birthday. Yes, she knows that she should be patient, and that his ADHD makes focusing on a task by himself very difficult, but it's her day, right? And she finally gets to see her best friends Essie and Alex, whom she left behind when the Mirza family moved from a smaller house to the Upper East Side. At least her Aunt Zohra brought a cool present--or so she tells Ahmad, to distract him. THE GAUNTLET OF BLOOD AND SAND, the coolest game any of the kids has ever seen, is just sitting there in Aunt Zohra's room, begging to be opened. Alas, this is a rather malevolent game, and it snatches Ahmad up in one quick gulp before Farah can say "boo." Aunt Zohra, horrified, reveals that she was the last to play the game with her friend, but they became separated and he had to stay there, in the game, for all eternity. In spite of the fact that Ahmad is loud and rude and annoying, Farah is determined to rescue him. Besides, a Mirza has never met a game they couldn't dominate. And they literally dive inside the game, arriving in a bustling souk in the city of Paheli. Ahmad is nowhere to be found, and the three friends soon find out from Madame Nasirah, the gamekeeper who runs a tea shop and is prone to frightful bouts of memory loss, that the master of the game does not intend to let them win. He will cheat in order to keep them in Paheli forever. Can Farah and her friends beat the game and save Ahmad? This book is just delightful. It's fun and sweet and absolutely bursting with details about Farah's life and religion, which are so different from mine. And yet, I never felt like I was rudely intruding into her traditions or beliefs. Riazi explains things in such a matter-of-fact way (having to stick ALL THE BOBBY PINS into her hijab to keep it in place, ugh, so frustrating) that I kept saying, "Oh, cool, I didn't know that before!" I loved how many of the games were not typical Western games, but something that was, to me, fresh and new. This is the great thing about books that share culture: they help kids grow in empathy and they stoke the fires of curiosity. For make no mistake--this is a middle grade novel, not a teen book. It's intended for kids and that is wonderful. I've seen some critiques that say it's not bloody enough or complex enough. Um, as an old lady here, I couldn't figure out the puzzles that Farah did, and having a dessert naming test instead of, I don't know, a butchery test is adorable and delightful and sweet. Which brings me to the food. Ah, glorious, glorious food. Riazi's descriptions of Bangladeshi sweets and her family's savory snacks made me rue the fact that there is nowhere in my city to buy any of these things. Even when not explicitly talking about food, Riazi would a comparison that involves food and it would send my tastebuds into overload mode. I look forward to many, many more books from the lovely Kaye, and I am profoundly grateful that she wrote this one. Oodles of kids will be able to pick up this book and feel accepted and loved. Also, there is a killer board game. Win win!